How to be REALLY cool. Ever notice how some of these Ultra KOH drivers just seem to be REALLY cool? Like Humprey Bogart, Steve McQueen cool? Well, here's the secret: The REAL cool guys run my "Keep Public Lands Open to the Public" stickers on their rigs. yes folks...now YOU TOO can be cool just like them and run one of these stickers on your rig! For just FIVE BUCKS plus s&h, you can get one of these stickers in black or white! So if you want to start being cool like Travis Carpenter and the like.. The stickers are 3x5 inches. The "Keep Public Lands" part is above the "Open To the Public" In these pics I cut the sticker in half to have it all run on one line. When I get more money, I will have the bigger windsheild stickers available. Last edited by Kurtuleas; 02-15-2012 at 10:48 AM. Last edited by papee; 02-15-2012 at 11:17 AM. Woohoo! I'm gonna be cool!!! Nice. I'll grab a few to help cover up the rust on my rig. Got any quad or MX sized steekers? I still think the Tooth and Nail sticker should be done. Tooth and Nail for every Inch of trail! It's never how far or fast you CAN go. It's always how far or fast you WILL go. Do you have Black vinyl or are they only white? For just FIVE BUCKS plus s&h, you can get one of these stickers in black or white! if you dont like my crap build your own! Kurt - are the letters on a clear background or are they colored? Not yet. I need the money to make other sizes first. quite frankly, I am SERIOUSLY broke right now, which is one reason I started selling these. I brought 100 down to KOH to help pay for my trip...and only sold like 3. I think that was the greatest qoute I ever had.. There is no background. They are die cut vinal stickers. You can send me a check if need be. PM me for my addy. The bigger ones (Not avalible just yet) make GREAT rocker panel stickers.. 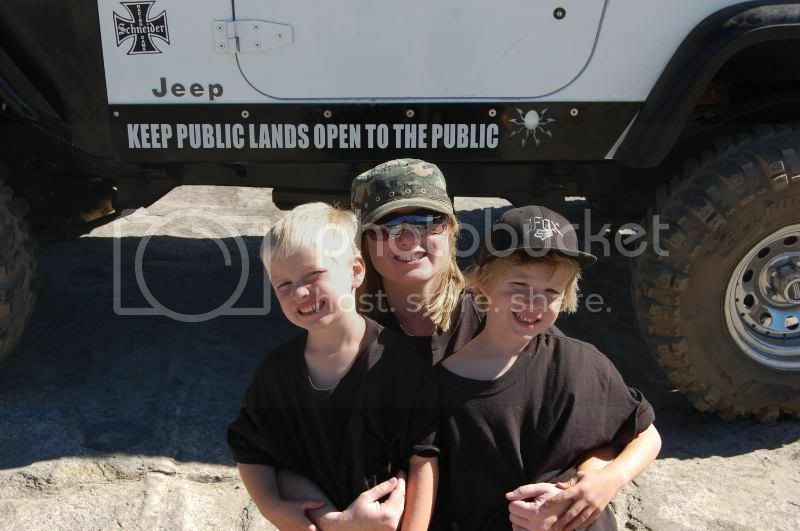 The wife and my boys on the Rubicon..
Last edited by the_white_shadow; 02-15-2012 at 01:00 PM. "Just when I think you've gone and said the stupidest thing ever, you keep on talking!" have em on all my rigs. thanks kurt!! Sent you 14.50 for two. "Just remember, you are unique............Just like everybody else!" I get more people asking about this sticker on my rig then any other sticker. It definitely helps educate people about land closures and getting involved in land use issues. Glad to see these up for sale! Paid for one each black and white. Last edited by randy92782; 02-15-2012 at 02:13 PM. Just sent you $25 for 4 stickers. Two black, two white please (included it in the message box). Thanks Kurt! Also shared this on the Marlin Crawler board. Last edited by yotasmob; 02-15-2012 at 02:19 PM.